When I first saw Bob Bertles on television in New Zealand in the 1960s he was a striking figure: imposing not just of stature, but of hair (an out-sized Afro). His visceral, driving alto and baritone saxophone playing was equally commanding, and this was not in a jazz context, but the chunky r’n’b of Max Merritt and the Meteors. The Afro is ancient history, of course, yet Bertles remains imposing, and perhaps it was always a big man’s absence of timidity – a crash or crash through mentality – that made his playing so compelling, whether amid Johnny O’Keefe’s rock’n’roll, Nucleus’s fusion, his own bands or Ten Part Invention. He thinks the secret to being a good musician is to never stop learning. ‘Each performance you try to be better than the last one,’ he says. Born in 1939 in Newcastle, Bertles took up clarinet aged nine, teaching himself for the first seven years. The impetus was infatuation with his parents’ Benny Goodman and Artie Shaw records. ‘I used to brainwash myself with them,’ he says. ‘From as early as I can remember – probably three or four – I wanted to play the clarinet.’ Discovering Charlie Parker opened up another world of musical possibilities, and at 16 he bought an alto and began taking lessons. He had already been playing suburban dances, but in 1956, alto in hand, he joined his first jazz quartet. Having bought a baritone, he also teamed up with rock’n’roll outfit Johnny Reb and the Rebels, with whom he was recording in ’58 when Johnny O’Keefe walked into the control room, saw the baritone and asked Bertles to join his band. Bertles had first heard McLean on 1956’s Jackie’s Pal, which, he says, defined the way he wanted to play. He always tells his students to ape their favourite musicians. ‘You’re never going to sound like them,’ he says, ‘but it’s going to get you going in the right direction. You’re still going to get your own sound and style.’ He was in his McLean phase when he first recorded for ABC radio and led a quintet at the El Rocco, which variously included Dave Levy, Keith Stirling and Bruce Cale. Cale says that of the all the musicians he had worked with at this time he thought Bertles the most gifted. Meanwhile he moved around the country until joining Max Merritt in 1967, with magisterial drummer Stewie Speer soon following him. ‘For me it was a dream,’ Bertles says. ‘I think it was the best rhythm section I’ve ever played with. I could do anything and it just sounded right.’ In 1970 they moved to England, where their ambitious manager leased an eight-bedroom mansion in Surrey, and the band – all on retainers – moved in, complete with families. They created a studio in the coal cellar and hired the Rolling Stones’ mobile studio to record an album. No release ensued, and they played virtually no gigs. Frustrated, Bertles sought alternatives, and soon found himself doing three recording sessions a day for the likes of Cilla Black and Cliff Richard (with whom he also toured). ‘While all the other blokes are sitting at Reigate twiddling their thumbs, I’m out on the road having a great time and recording,’ he recalls. ‘Then I got the chance to join Nucleus, so I said to Max, “Sorry, man. I’ve got to do it.”‘ Led by trumpeter (and Miles Davis biographer) Ian Carr, Nucleus was one of Europe’s foremost jazz-rock bands, and Bertles recorded four albums with them. In 1976 he returned to Sydney, joining the Col Nolan Quartet, in which he took up tenor. After that he formed his own Moontrane, which recorded as a sextet with Miroslav Bukovsky, Dave Panichi, Paul McNamara, Darcy Wright and Alan Turnbull. Meanwhile Bertles taught at the Conservatorium, and in 1981 played in his first theatre show, Chicago, starring Nancye Hayes, whom Bertles subsequently married. His theatrical career peaked when, aged 64, he became a quadruple threat in The Threepenny Opera: singing, dancing, acting and playing saxophone. Highly acclaimed, the production toured to Colombia. 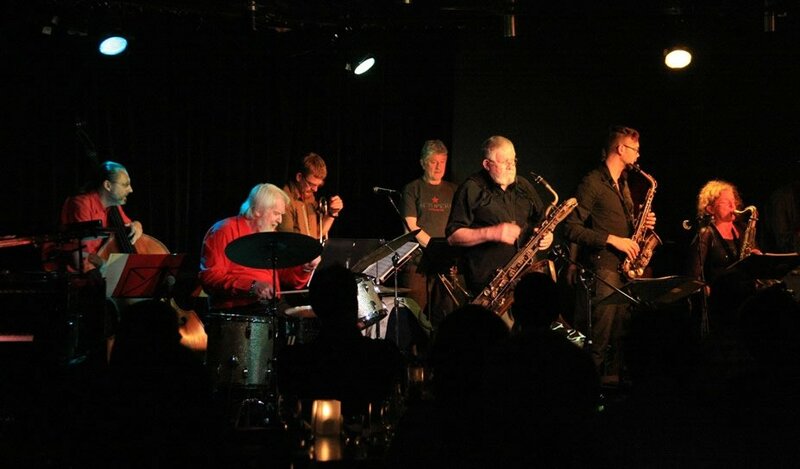 Thanks john for another wonderful article on the heroes of australian modern jazz.